In 2013, the richest one percent of Americans will receive 18 percent of the tax cuts while the middle fifth of Americans will receive just 9 percent of the tax cuts. The bottom three-fifths of Americans will receive 18 percent of the tax cuts. In other words, the richest one percent of Americans will receive the same share of the tax cuts as the poorest 60 percent of Americans. The widely-used $620 billion figure is calculated by comparing the bill’s provisions making permanent most of the Bush-era tax cuts to a proposal for making permanent all the Bush-era tax cuts. As explained below, the revenue “savings” is likely to be offset by the business tax cuts that are also included in the bill. 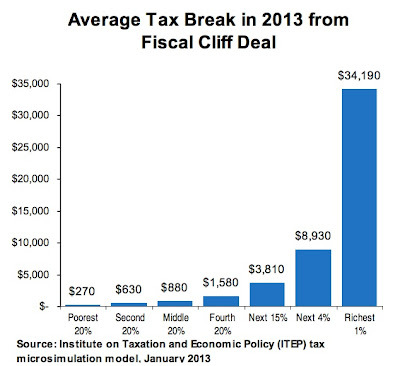 The fiscal cliff deal makes permanent 85 percent of the Bush income tax cuts, at a cost of $3.3 trillion over ten years. The fiscal cliff deal makes permanent 95 percent of the Bush estate tax cut that was still in effect in 2012, at a cost of $369 billion over ten years. For more details, read the original reports.